SCORPIO TECHNOLOGY has many components for participation in the various SOLAR CHALLENGES, including specially designed solar panels. 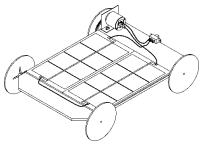 The sections below contain information about the various components required to design and build a SOLAR CHALLENGE entry. Please check your states SOLAR CHALLENGE regulations to ensure you comply. For solar panels and other components used in solar power experimentation please refer to our Technology catalogue.